We are all governed by principles. A principle is essentially a rule or a law that we must follow. At any one time, we could have many principles acting upon us. -If I run a red light, I will get a ticket. -If I jump off this balcony, I will fall to the ground. -If I steal this 5 Hour Energy drink, and get caught, I’ll be punished. These principles are affecting our daily life in inconceivable varieties. Yet have we ever thought to wonder what principles are affecting our fitness ability? How have the Michael Jordans’ and the Tiger Woods’ rose to the upper echelon of performance, while others succumb to the temptation of quitting their exercise program in lieu of a bag of potato chips and the latest episode of American Idol? Why are principles so important to our fitness success? So often we let the hands of fate guide how fit or unfit we will be. For many however, at some point, they wake up one day and realize they are overweight, pre-diabetic, or worse. How do we ensure that we won’t allow the hands of fate to dictate our fitness level? It comes down to one word: PRINCIPLES. We must live by a set of principles that we have created ourselves. These principles must be based on our personal values and goals. They must also be the fire to get us up early on Saturday mornings to get our run in and be a protective guard rail against the forces of life that quietly and sometimes imperceptibly inch us away from our vision and our dream. It’s time to take action. It’s time to take control. 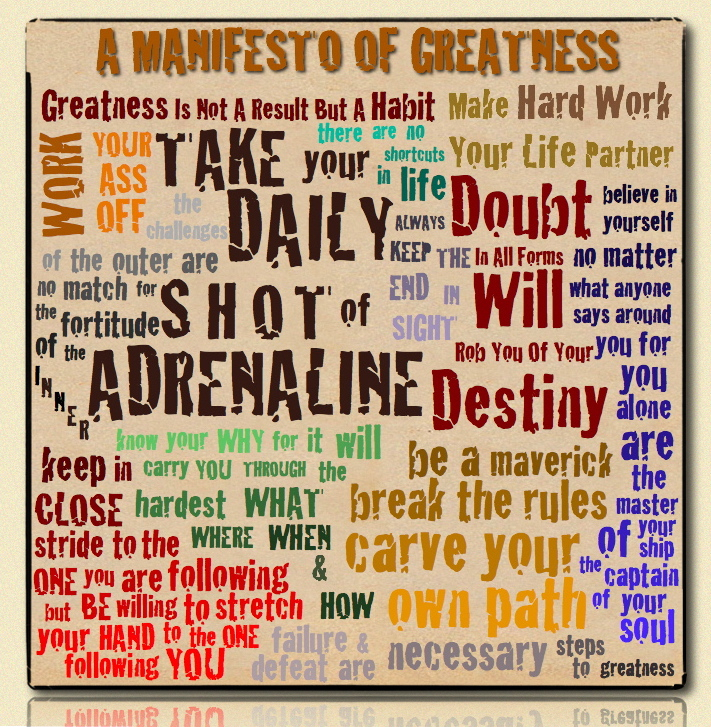 It’s time to create our own personal fitness manifesto that will inspire us to greatness. 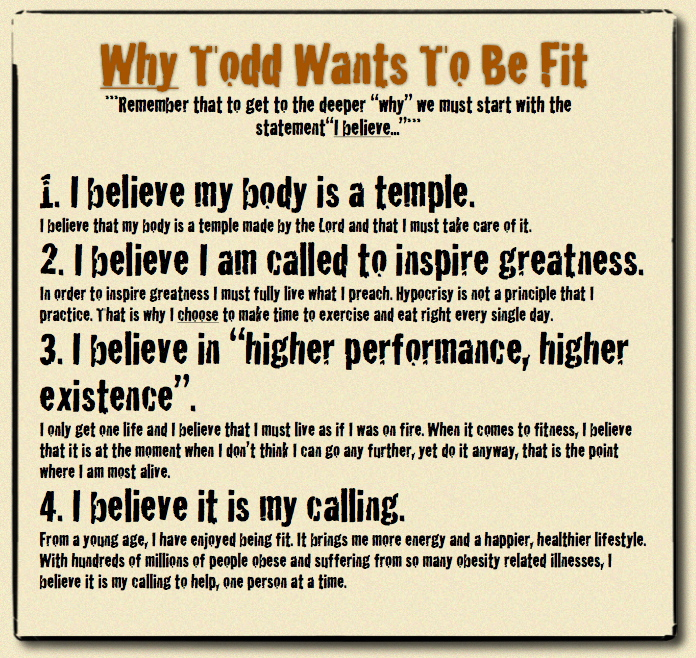 You must get absolutely clear on WHY you want to be fit. Simon Sinek in his Ted Talk and understanding of The Golden Circle explains it very well. He says that all the greatest individuals throughout history did things differently. He said that they actually moved from the inside out. They knew their “why” before they began a particular activity. This is super important for us who are striving toward greatness in fitness because we need to be able to control our bodies even past the point of difficulty. If you haven’t learned how to battle the mind effectively and learned the advise of 25 of the greatest athletes and how they do it, you’ll want to do that next. For this step in creating your Personal Manifesto of Greatness and discovering your principles, you’ll need to discover your why in relation to fitness. 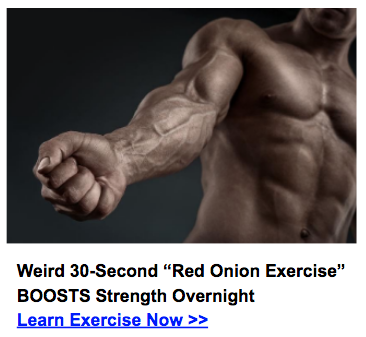 So here’s your first action item in creating your fitness manifesto. It will help form the foundation for your principles. Get out a piece of paper and spend some time reflecting on “Why you want to be fit.” If general fitness isn’t your goal write out “Why you want to be the greatest soccer player or MMA fighter or whatever.” Make it personal. For a more in depth resource on how to create and discover your values, I highly recommend “The Art of Manliness’ Define Your Core Values” article. And to see a ton of examples of value statements, see the Manliness Community. Before you go on, watch the above video. With this speech, Darren LaCroix won the international Toastmasters speakers competition. The word “inspiring” doesn’t come close to describing it. Why do we need to set goals…? Why Do 3% of Harvard MBAs Make Ten Times as Much as the Other 97% Combined ? *The 13% of the graduates who had goals but not committed on paper, were earning on average, 2X as much as the 84% who didn’t have goals. *Yet here is the kicker! : The 3% who had goals that were clearly defined and written down were earning TEN TIMES AS MUCH AS THE OTHER 97% PUT TOGETHER. Learn more about this study and the importance of personal development here. In fitness we must set clear, defined goals as well. Each goal must include five elements. These are defined as S.M.A.R.T. goals. Specific -Get as absolutely clear as possible. Attainable – This goes back to your value statement above, “I believe…”. 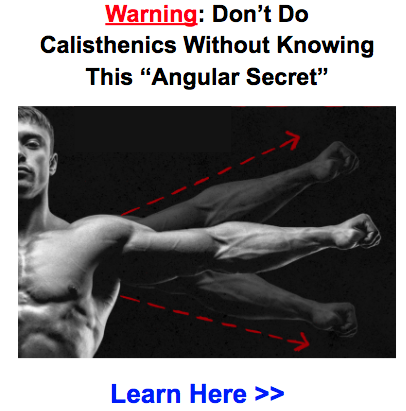 If you don’t actually believe it, you will not be able to achieve it. Realistic – You must be “willing and able” to work toward this goal. Saying I will compete in the Hawaii Ironman in a couple months, while you are finishing up your Masters degree would probably not be wise. Though I am a huge advocate for setting goals that are “Impossible”. Check out my buddy Joel Runyon’s Blog of Impossible Things to see a list of things you may think are impossible, but he has them on his bucket list and is achieving them. Timely – You should ground your goal with the framework of time. “Someday” doesn’t work with setting goals. You must decide the deadline for when you will have completed your goal. For an INCREDIBLE Goal Setting Guide for 2012, click this link. It’s an article by the founder of Live Your Legend, Scott Dinsmore, and is truly epic. So we come to the final step. This the time that you reflect on the values you have established and goals you have written down. Few people on earth know and clearly understand their values. Fewer people (as the Harvard study above showed) have written out S.M.A.R.T. goals for their life. Yet the fewest people on earth spend the time to establish the guiding principles for their life. It’s time to set up the guard rails for your life & your personal manifesto. 1. Trust Yourself – Dig deep and figure out who you want to be. “How many times have people heard “It can’t be done” or “It’s never been done before”? Don’t listen to them. Arnold says, “I never listen to ‘I can’t.’ I only listen to myself and say, ‘Yes, you can’”. Arnold knows the importance of giving back. Creating a legacy is extremely important and is a part of his personal manifesto. (To see an inspirational video where Arnie explains these principles, click here). Martina is considered one of the greatest singles, doubles and mixed doubles players to ever have lived. There is a great interview where she describes her personal philosophy. To read the full article, click here. Martina explains in the article that the fact that she loved tennis so much was one of the biggest reasons she has become so good at it. “I was never afraid to learn new things” said Martina. She was always trying new things and discovering ways of innovating her techniques and trying out new equipment. Of course, this is my favorite of her principles. In the interview, she explains that after she gave up tennis she gave up her exercise routine too. Yet she quickly realized that she had to stay in shape in order to keep her energy and mood levels high. John Wooden has to be one of the greatest coaches to ever live. He won ten NCAA championships in a span of 12 years. Below are his personal principles that he lives by. He has actually written a book on the principles called 7 Principles That Shaped His Life and Will Change Yours. Second, write down your S.M.A.R.T. goals. This will help provide an ending point you are shooting for. Now, spend some time thinking through what principles you want to guide your fitness life. Write them down and hang them on a place you will see them every day. Let me know if you have any questions or get stuck. Looking forward to seeing what you come up with! Great post. The manifesto looks terrific. I did something similar a few months back. I think it is a great motivating tool. The T in S.M.A.R.T goals in so critical. Without that time requirement I think we can get lazy and put things off. I’ll start my diet monday, or I’ll take that trip when work settles down. Bologna! Love the Simon Sinek reference. What a great Tedx Talk. Keep up the great work and continued success. Thanks so much for the encouragement. You are so right, manifestos really do motivate us a ton. Keep me updated on your diet. Here’s a great article on Losing Weight, from my good buddy Phil Drolet at The Feel Good Lifestyle. Yeah, Simon is the man. I created that image off of his insights. Keep me posted on your goals. When we don’t stick together, we do fall into laziness, like you said. We are stronger together. You are certainly welcome Dawn! It was a pleasure writing it! Remember to start with “why” and you’ll have most of the battle already won! Thanks for this great article! I’m finally ready to really commit to improving my health & fitness, and creating a personal manifesto is exactly the jump start I need. And this article is proving invaluable as I try to write my own. Thank you, thank you! You are very welcome Tiera! Having a manifesto has definitely helped me. You may also want to create a vision map. These are really helpful too. Let me know how I can help support you as you commit to improving your health!